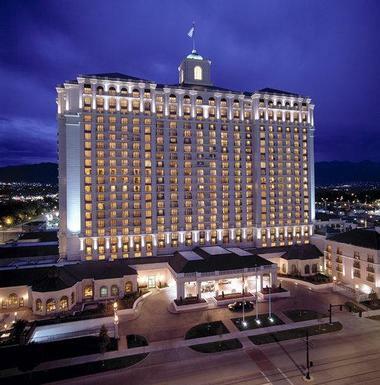 The Grand America Hotel, located in the heart of Salt Lake City, offers a dream vacation on the grandest of scales. At no additional cost, the concierge can arrange for tours of the Grand America. The hotel is appointed with priceless antiques and artworks that are truly remarkable. Don't miss this opportunity to learn about the history of the precious works of arts that adorn this hotel. Families First is a family friendly program is geared toward making children feel at home while traveling. Amenities include cribs, strollers, rocking chairs, bath accessories, and more. The concierge can also arrange babysitting. Contact the concierge for more information and pricing. 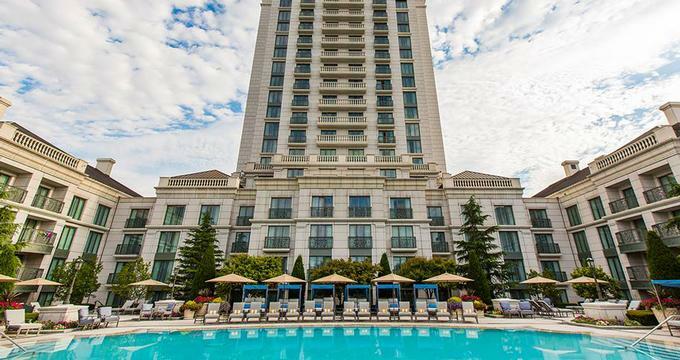 The Grand America Hotel offers a variety of large spacious guest rooms and suites.The 24-floor, 775-room hotel offers upscale amenities in every room. Complimentary Wi-Fi, an in-room safe, and large flat-screen television sets are in every room. Each room has a balcony with spectacular city or garden views. The bathrooms are constructed with Italian marble and feature a separate shower and soaking tub. Dual vanities with lighted makeup mirrors complete the elegant spaces. 24-hour room service is also available. These rooms are a generous 700 square feet. They are beautifully appointed with elegant furnishings and plush bedding to give you all the comforts of home. The king room has a separate living space with premier furnishings, whilethe double queen room has a smaller seating area, though it is still lovely and comfortable. The gorgeous walk-out balconies complete this room. The executive suites boast 880 square feet. In either a king or double queen configuration, this type of suite has so much to offer. A separate living space with French doors to close off the bedroom lends itself to creating a more private space, and thepanoramic views will not disappoint. The executive suites are also available with full kitchens. Similar to the Executive Suites, this suite has a small but fully functional kitchen that allows more flexibility for family time or entertainment. Featuring a large living space with French doors that close off the bedroom, this suite is amenable to small families with children. The double queen bedrooms can accommodate four people. Some of the kitchen suites also come with a washer and dryer. Whether for business or pleasure, this suite can offer the privacy, flexibility, and comfort required. For a more intimate getaway, choose the Grand Spa Suite. 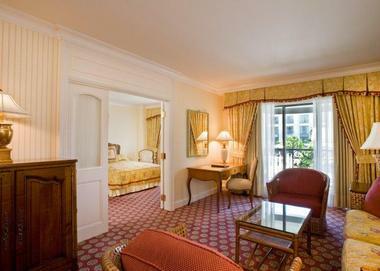 This suite hosts a separate living and vanity area, andthe king bedroom is plush and comfortable. The rooms feature floor to ceiling windows that provide an abundance of natural light. This suite offers a variety of in-room spa treatments and health-conscious menus. Spark a little romance with this extraordinary suite. Featuring a full-sized living room and separate dining room with seating for eight, this suite offers a spacious, elegant entertainment space. The full kitchen and breakfast bar complete with espresso coffee maker offers you the liberty to put your culinary skills to work. Or, with 24-hour room service, you can order up a selection of hors d' oeuvres, light meals, or desserts to offer visiting guests. A separate powder room is included. The opulent king bedroom has its own separate seating area and en suite bathroom with dual vanities. Situated on an upper floor, this suite has it all, including lovely panoramic views. Serving breakfast, lunch, and dinner the Garden Cafe has menu choices that are absolutely scrumptious. Offering classic breakfast dishes, traditional soups, salads and sandwiches, and signature entrees, this cafe with delight every palate. 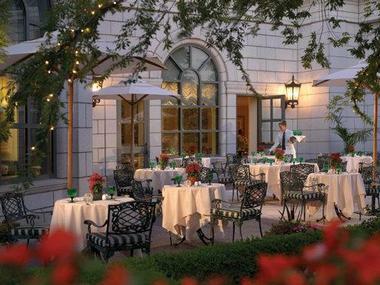 The Grand America boasts two lounges: the Gibson Lounge and the Lobby Lounge. Both lounges have comfortable seating, a great ambiance, and a full-service bar. The Lobby Lounge has a traditional menu of hors d oeuvres, soups, salads, sandwiches, and signature entrees. Live music is also featured in the Lobby Lounge. The Gibson Lounge is open from 5 p.m. to midnight (M-F) and noon to midnight on Saturday and Sunday. Similar to the Lobby Lounge, the Gibson serves a comparable menu. La Bonne Vie is a coffee shop featuring pastries, macaroons, other sweet treats and an espresso bar. Traditional Afternoon Tea is served daily in the Lobby Lounge and features all the delicacies of a European tea - finger sandwiches, scones, clotted cream, and more. Finally, the Grand America Hotel serves up Sunday Brunch from 9 a.m. to 2 p.m. Enjoyed by hotel guests and locals alike, this brunch is fantastic. There are seven stations that include everything one would want: a morning station (eggs/omelets), a crepe station, a carving station (prime rib), an antipasto station, a paella station, a weekly chef's station, a kid's station (pizza, macaroni& cheese, etc. ), and a dessert station. All of this is complemented with a large buffet featuring salads, crudites, and signature entrees. The brunch is $49/adults and $24.50/children. The Grand America Hotel offers over 75,000 square feet of meeting space. Able to accommodate small and large groups, the hotel has a professional, experienced staff at the ready to help you coordinate your event. The hotel has two grand ballrooms, a grand salon, twenty separate meeting rooms, and the center courtyard surrounded by lovely elegant gardens. The Grand America catering services offer a full menu of traditional and signature dishes. Let a meeting planner assist with your menu choices to help make your meeting successful and memorable. The Grand America Hotel also has wedding packages to help you create your perfect wedding day. There are several venues to choose from, and you can have a casual wedding or a most elegant formal ceremony. Photo services are also available. 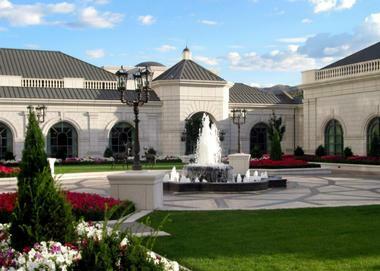 Located just a few miles from the Salt Lake City International Airport, the Grand America is easy to access. A full complement of rental car companies is available at the airport, and if you don't want the hassle of driving, taxi service is also an option. The average fare is about $25 one way. The Grand America offers a broad array of services to help you put together an unforgettable vacation. The concierge can handle all transportation needs, from rental cars to cabs and limo service. In-room VIP amenities are available to welcome special guests. Items such as wine, French pastries, a children's game package, chocolates, cookies, snacks, and other unique amenities are available to make guests feel at home. Additional services include reservations for restaurants, event tickets, spa appointments, and extras such as in-room floral arrangements. If you are looking for an outdoor experience, the concierge can help you rent ski and golf equipment and set up arrangements for various adventures such as horseback riding, fishing, rafting and ice skating. For guests' convenience, an array of shops and boutiques can be found on-site. The JouJou is a wonderful boutique filled with toys, books, candies, experience stations, and the like. Arranged with youth in mind, this shop will captivate young minds. La Bonne Vie is a spectacular bakery featuring delightful pastries, cakes, and cookies. Also available is gelato, artisanal chocolates, and an espresso bar. The on-site pastry chef makes the pastries fresh daily. The Men's Haberdashery, a men's clothing store, carries sportswear, outerwear, and accessories perfect for any gentleman. Shirts, trousers, ties, and more - this shop provides an excellent array of clothing, from casual to elegant. The shop also offers alterations. The Ladies Boutique features the latest fashion trends. With styles that are just right for casual, business, and formal events, every woman can find something fresh to compliment her style. Alterations and gift wrapping are offered. The Newsstand, providing sundries and basic necessities, has a little something for everyone. Newspapers, magazines, candy, snacks, soft drinks, and personal care items are just a few of the selections available in this shop. Set in the middle of Salt Lake City and surrounded by grand mountains, this venue is extremely inviting. The guest rooms are appointed with grand furnishings and have spectacular views, and the outstanding services and amenities make your stay all the more grand. The local activities, events, and venues offer an excellent opportunity to explore nature, art, music, cuisine and recreation. Back to: Best Things to Do in Salt Lake City, Best Southwest Vacations and Weekend Getaways in Utah.